Last year, I stumbled upon the novel Eight Hundred Grapes by Laura Dave, and it quickly fell into my stack of favorites for the year. I recommended it to all my friends – and even bought copies as gifts. 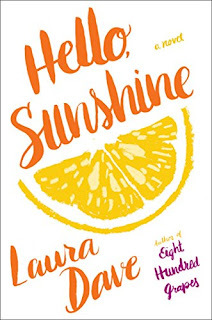 So, it should come as no surprise that I was thrilled when I heard Laura Dave had a new novel coming out this summer or that I read it as soon as I had the opportunity. Usually, when you love a book so much, the next one does not live up to your hopes for it. This was not the case for Hello, Sunshine. This book is such an enjoyable read. It is both perfect for these summer days and thought-provoking. I like my summer reads to be fun and meaningful. Not too much fluff, but not too heavy. Hello, Sunshine fits this description entirely. The novel focuses on Sunshine – a celebrity cook on her way to a new Food Network show who lets you know in the first few pages that she is a crappy person who has made a series of terrible self-serving choices. Her honesty in the first chapter is almost painful when readers learn that the reason she is a not-so-great person is because her entire cooking empire is built on a lie. A hacker manages to ruin her career, reputation, friendships, and marriage in a single day by exposing her lies. Yet, somehow even knowing she herself said she is not a good person and knowing the things she did, I still rooted for her. There was something genuine about this “liar.” More so, she really suffers as a result of the hack. It is so easy to get caught up in celebrity brouhaha and wish to see someone “get what they deserve,” but it is something else entirely to read about it. For instance, as a reader, I did begin to empathize with Sunshine. I did not agree with her choices, but I understood why she felt she had made them. Laura Dave’s does a fantastic job of developing realistic characters. Additionally, while the plot is entertaining and frothy, the book also brings up a lot to consider about our true lives and the lives we curate for social media. Does social media make it normal to lie or curate a life that is not really your own? Kudos to Laura Dave for crafting an entertaining summer beach read that is also fit for book club discussions. This book will be released next Tuesday, July 11th, but you can preorder it from Amazon here. This is an affiliate link. Thank you for supporting my blog!